Atheneum Books for Young Readers, 9781416942085, 208pp. Twelve-year-old Audrey Abbott dreams of becoming a writer, but with her father's failing health and the family's shaky finances, it seems there is no room for what her overworked mother would surely call a childish fantasy. So Audrey keeps her writing a secret. That is, until she meets a mysterious old woman who seems able to read her mind. Audrey is surprised at how readily she reveals her secret to the woman. 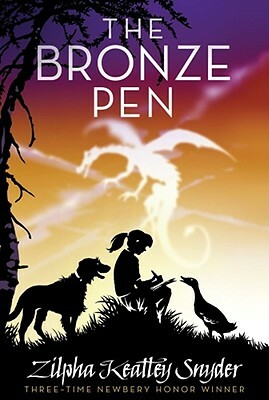 One day the old woman gives Audrey a peculiar bronze pen and tells her to "use it wisely and to good purpose." It turns out to be just perfect for writing her stories with. But as Audrey writes, odd things start happening. Did Beowulf, her dog, just speak to her? And what is that bumping under her bed at night? It seems that whatever she writes with the pen comes true. However, things don't always happen in the way that she wants or expects. In fact, it's quite difficult to predict what writing with the pen will do. Could the pen be more of a curse than a gift? Or will Audrey be able to rewrite the future in the way that she wishes---and save her father's life?